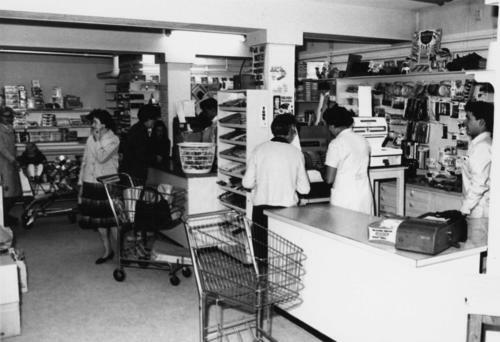 Photograph depicts women, men, and children standing in store, some pushing grocery carts. Two women stand near till, one wearing long white professional jacket. Young man named Lobbes stands behind counter on far right, wearing white shirt. Store appears to be stocked with groceries and general supplies. Handwritten annotation on recto of photograph: "RIGHT TOMMY LOBBES".